Part I: Cognitive Psychology. Introduction. Mental Models, Sentential Reasoning, and Illusory Inferences. (P.N. Johnson-Laird). Interaction of Knowledge and Working Memory in Reasoning about Relations. (A. Vandierendonck, V. Dierckx, H. Van der Beken). Mental Models in Learning Situations. (N.M. Seel). Part II: Cognitive Neuroscience. Introduction. Resolving Valid Multiple Model Inferences Activates a Left Hemisphere Network. (R.L. Waechter, V. Goel). A Neuro-Cognitive Theory of Relational Reasoning with Mental Models and Visual Images. (M. Knauff). Part III: Perception, Emotion, and Language. Introduction. Pictures, Perception, and Mental Models. (K. Rehkamper). Emotion, Decision, and Mental Models. (M. Pauen). Language Processing: Construction of Mental Models or More? (B. Hemforth, L. Konieczny). Part IV: Philosophy of Mind. Introduction. Visual Imagery, Mental Models, and Reasoning. (V. Gottschling). Mental Models as Objectual Representations. (C. Held). 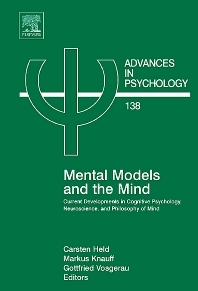 The Perceptual Nature of Mental Models. (G. Vosgerau). Index.